Raumfahrt+Astronomie-Blog von CENAP - Blog: Raumfahrt-History - Did you know Israel sent a rocket into space in 1961? How the US-USSR space race, regional security threats, an arms race, and an upcoming election contributed to Israel’s first rocket launch, Shavit 2. 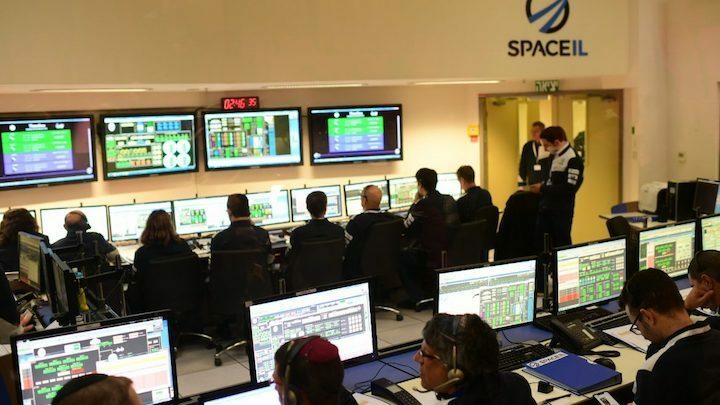 Israelis were bursting with pride on Friday, February 22, 2019, whenthe first “blue-and-white” spacecraft successfully blasted off in the first ever privately-funded Moon mission. The notion that this tiny silver of a country could be a leader in space flight and exploration is rooted, in part, with the Israeli Air Force. 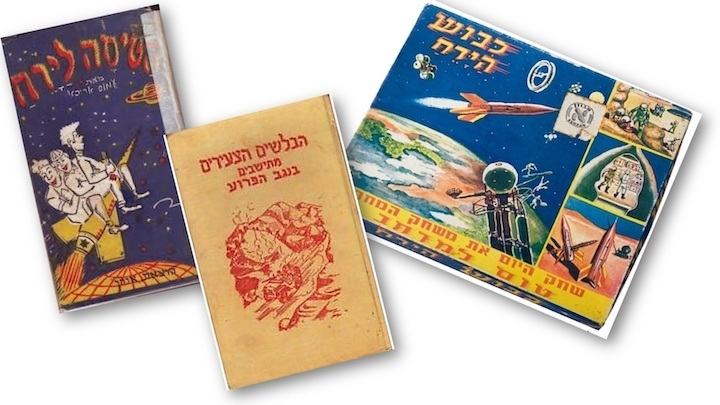 Even before that, the Hebrew – and Yiddish- language periodicals frequently published articles about space exploration, while science fiction inspired children to look to the skies, as in “The Flight to Mars,” a 1947 book by author Yitzhak Avnon about a boy and his dog who flew to the Red Planet in a rocket ship. 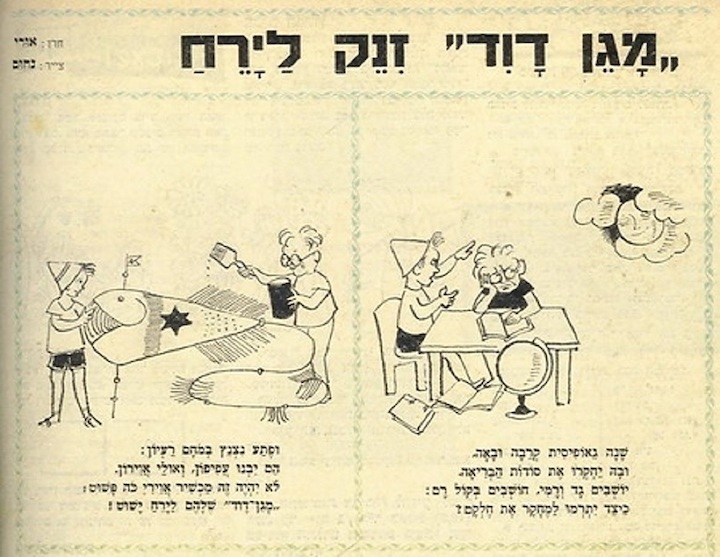 In 1957, in the run-up to the Jewish New Year, children’s weekly magazine Davar Le Yeladim published a story written by “Uri” (Uriel Ofek) with pictures by “Nahum”(the well-known artist and illustrator Nahum Gutman). In doggerel rhyme, the heroes of “Magen David to the Moon,” two young kibbutzniks named Gad and Rami, reflect on the year gone by and wonder how they can “contribute to research.” They hit upon the idea of building a kite that can fly to the Moon. Although some grown-up foreign scientists attempt to compete by launching a rocket, in the end the boys win a gold medal. The story became real only a few months later with the October 1957 launch of the Soviet Union’s Sputnik satellite. Just as this event thrust the United States into high gear to win the space race, so Israel was galvanized into action. 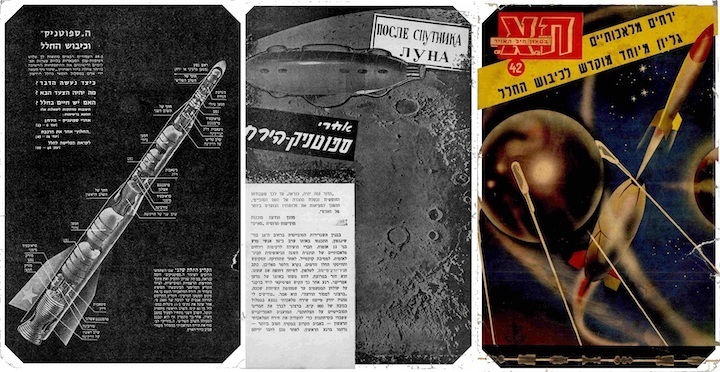 The IAF magazine devoted almost its entire December issue to Sputnik. Ben-Gurion knew that the USSR’s potential to control the skies overhead posed a real threat to Israel, as the Egyptian Air Force had access to advanced technologies from Russia. In addition, Gamal Abdel-Nasser, at that point president of the United Arab Republic (the union of Egypt and Syria from 1958 to 1961) had recruited German rocket scientists– former Nazis– to work on Egypt’s armaments program. These factors were, in part, the impetus for creating Israel’s space program. In 1960, the National Council for Space Research was established in Israel, headed by Prof. Ernst David Bergmann. On July 5, 1961, the first Israeli missile, the Shavit 2, a two-stage missile for meteorological research,was launched into space from Palmahim Beach. Shavit 2 was a most successful failure, according to a 2011 Israel Defense magazine story marking the rocket’s 50-year anniversary, which revealed previously confidential information. Mossad head Isser Harel presented this intelligence to Ben-Gurion, who decided to steal Nasser’s thunder – literally – by ordering Israeli armaments development authority Rafael (which may have already been at work on the Jericho ballistic missile project) to build a rocket that could be launched into space before the Egyptians. Within a few weeks, the rocket was ready. 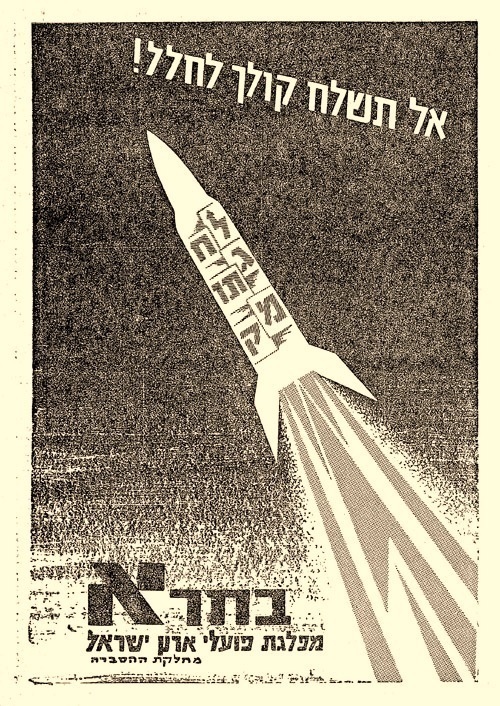 The launch took place on July 5, 1961, in the presence of about two dozen persons including Ben-Gurion, Foreign Minister Golda Meir, Deputy Minister of Defense Shimon Peres (who reportedly named the Shavit, the Hebrew word for “comet”), Chief of the General Staff General Zvi Zur, Defense Ministry General Director A. Ben-Natan, Deputy Chief of General Staff Yitzhak Rabin, Rafael staff, reporters and others. As the story goes, Ben-Gurion wanted to watch the launch from close-up, but Meir called him back into the protective bunker before liftoff. 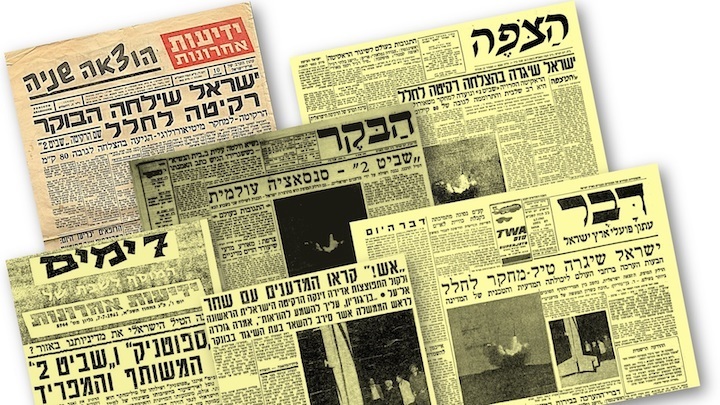 Israel’s newspapers enthusiastically reported the outpouring of national pride at the news, and there was positive coverage from the US, British and French news media, along with lukewarm reportage from the USSR, and almost no coverage in the Arab press. Cooling regional temperatures would have to wait. In fact, Israel Defense writes,“For years, the defense establishment did not publish many photos of the Shavit 2 or reveal its dimensions. Apart from a photograph of the rocket’s silhouette shooting up early in the morning, engulfed in a plume of smoke, the only published photograph was of Ben-Gurion and his retinue looking at the rocket while it was still on the ground.” The photo’s framing was deliberately misleading, according to Israel Defense, shot from a low angle to give the impression that Shavit was much bigger than its actual 3.76 meters in height. There was also another ruse at work: Although the missile’s first stage was successful, in the second stage the rocket blew up. In truth, the meteorological research objectives were not achieved. Two days after the launch, the US announced it would sell a number of rockets – again, for meteorological experimentation – to the UAR. There was more fallout, according to historian Prof. Rafi Mann, noting in an essay that Ben-Gurion was not immune to opponents who claimed the launch was nothing more than an election campaign stunt. In the elections of August 15, 1961, Mapai lost six Knesset seats but Ben-Gurion was able to form a government, and remained in office another two years. In early 1963, news was revealed that German scientists were assisting Egypt in the production of long-range missiles and non-conventional weapons. In 1967, after the Six-Day War, the development of Egyptian missiles was halted. In 1965, a university-based research project called the Institute for Space Research was established at Tel Aviv University, headed by nuclear scientist Prof. Yuval Ne’eman. The Institute later became, in 1983, the Israel Space Agency (SALAH). In 1988, Israel truly entered the space era with the Ofeq-1 satellite that was carried aloft by a Shavit launcher — harbinger of the string of amazing Israeli space advancements leading up to last week’s Beresheet lunar lander mission – with much more to come.